Real supporters cheered and waved club scarves as a bus carrying Cristiano Ronaldo and the rest of the team crawled past crowds lining the roads from the club's Santiago Bernabeu stadium to Madrid's La Almudena cathedral where the Champions League trophy was presented to religious leaders. "It is important to recall that our coach Zinedine Zidane has always worked with humility to become the best coach on the world," Real Madrid president Florentino Perez said in a brief speech in the cathedral as the players, who wore matching blue suits, listened from the pews. The bus then made its way with the team and the trophy in the front to the head of the Madrid regional government in the central Plaza de Sol which was packed with thousands of fans, many decked in Real's famous white and black team jersey, before it heads to the club's traditional celebration spot, the Plaza de Cibeles. Some children sat on the shoulders of their parents to get a better look as the bus went by. Thousands of supporters waited around the fountain in the heart of the plaza, which was surrounded by a white and blue banner decorated with the Real logo that read "Thanks Real Madrid supporters! ", for the players to arrive. 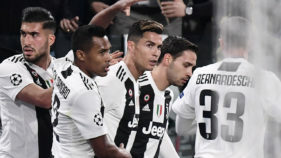 "I had to be here and celebrate this win with them," Ivan Gonzalez, a 23-year-old student who wore a pink Ronaldo jersey and a Real Madrid scarf wrapped around his neck, told AFP. Real Madrid fans packed Plaza de Cibeles late on Saturday after the club won a record-extending 13th European Cup with a 3-1 victory over Liverpool. Many headed to the central square after watching the match lit up by a wonder goal from Gareth Bale at the Bernabeu on eight giant screens. 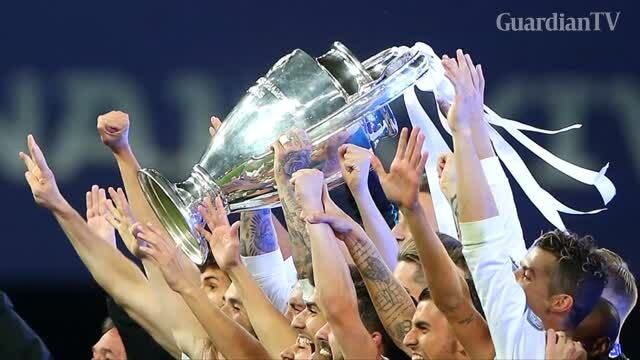 Roughly 80,000 Real Madrid fans at the stadium erupted in delight at the final whistle, breaking out in familiar chants of "Campeones, campeones". "This is incredible. It's beautiful belonging to Real Madrid, this is incredible," said Jose Manuel Rodriguez, a 50-year-old barman who came to Madrid from the northern Basque region to watch the match at the Bernabeu. "That is what Real Madrid has, it gives so much joy," he added. 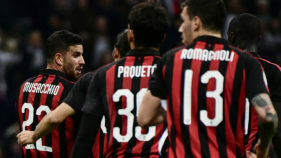 The club's "decimotercera," or 13th title in the competition, moved them six clear of second-placed AC Milan in the all-time honours list, after lifting the trophy for a remarkable fourth time in five seasons. Former French international Zidane also became the first coach to win three consecutive Champions League crowns, despite having spent less than three years at the helm. Spanish Prime Minister Mariano Rajoy, a die-hard Real fan, sent a telegram to the club's president, Florentino Perez, to congratulate the team for their victory, which he said had "revalidated" the club's "continental leadership". "Thank you for this sporting show that filled all sports lovers with emotion and pride, and for once again taking Spain's name to the highest levels of world sport," he added in the telegram, his office said in a statement. Rajoy had planned to watch the match in person in Kiev but he cancelled the trip at the last minute after the main opposition Socialist party filed a no-confidence motion against his government in parliament. Real's victory made the front page of all main Spanish newspapers on Sunday. "Madrid dominates Europe with a legendary team," headlined top-selling daily El Pais below a photo of Ramos holding up the Champions League trophy surrounded by the ream of his teammates. "An eternal Real Madrid," wrote rival daily El Mundo while conservative daily ANC headlined: "A Real Madrid of legend".